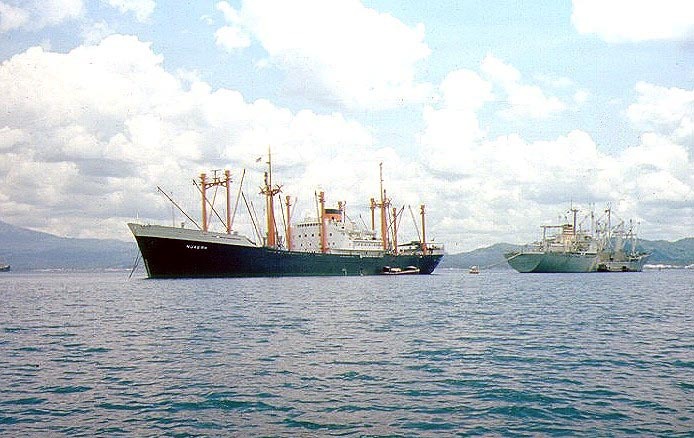 In January 1974 I was appointed to the mv Nijkerk, a beautifully lined little freighter that had originally been built for another company's South America service. In consequence the ship was quite different from all the others the company owned. In those days of the first oil crisis we were sent around the Cape of Good Hope again, bound for Indonesia at economical speed, a leisurely 12 or 13 knots. 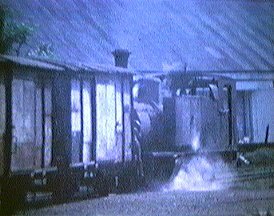 This didn't do the main engine any good as the exhaust channel fouled up with soot which regularly ignited, sending up a dense black cloud. After a few weeks we recognised the signs without looking: a sharp burning smell invading the wheelhouse, followed by the revolutions dropping and the inevitable telephone ringing from the engine room. I think we sanded burnt valve seatings about ten times in the thirty-five days it took us from Antwerp to Tanjung Priok. 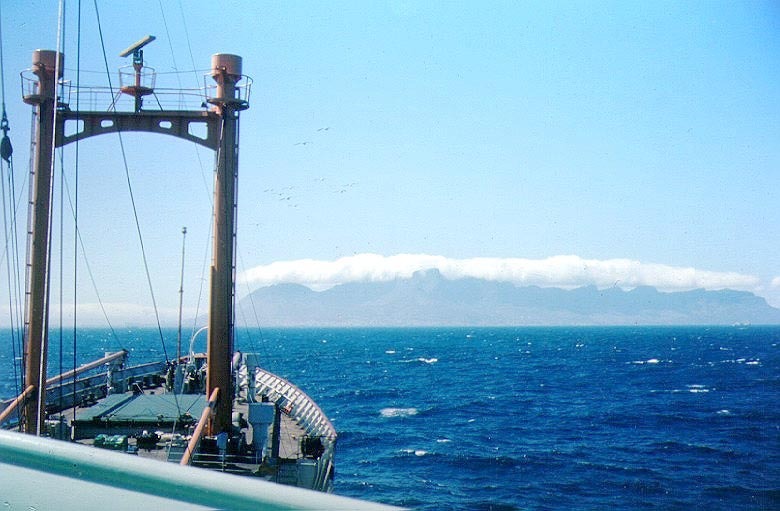 Approaching Cape Town in the daytime, to pick up mail and stores at sea. 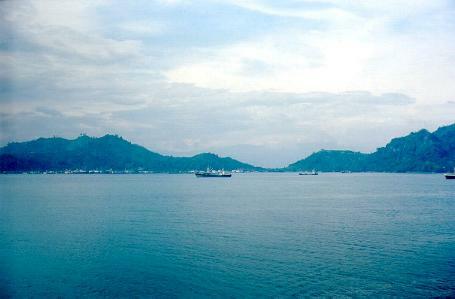 The approach to Teluk Bayur, with the warehouses on the left. We spent about two weeks in various ports in the Isle of Java, where I managed to go ashore only a few times, once on a Sunday trip to the Puncak Pass, and once to go shopping in Surabaya. 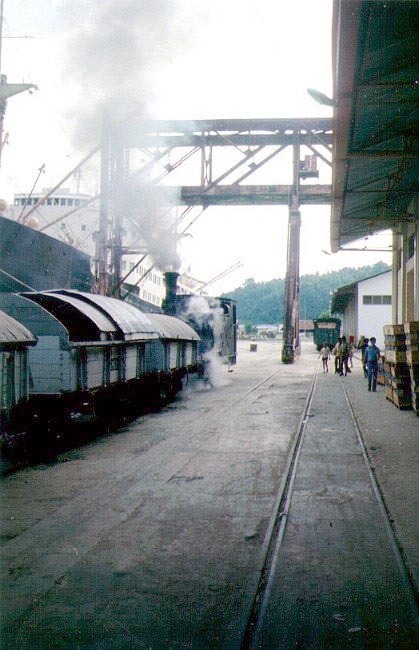 I didn't see a single steam locomotive in Java, mainly because there was no steam working close to the harbours, and in some places we had to anchor offshore. After finishing work in the East Javan port of Probolinggo, we returned through the Java Sea and the Sunda Straits on our way to Teluk Bayur near Padang. And here things proved to be very different. No. 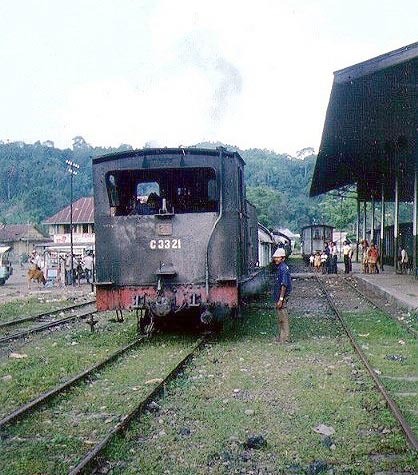 C3330 shunting at the far end of Teluk Bayur station. The ultimate colonial railway scene? Having a ride on C3330. 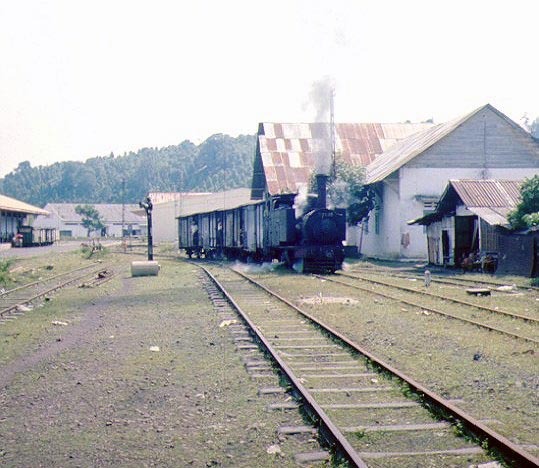 Right behind the warehouses was a station where twice daily a C33 class 2-6-0T would come in with a goods train, fuss around for one or two hours and then depart into the opposite direction towards the town of Padang. Traffic was quite busy on account of several ships loading there at the same time. It was not long before I boarded a steam loco with two bottles of beer for the crew, and asked if I could come along for the ride. No problem! Working a steam loco in the Tropics is a very thirsty job, so the smiling crew welcomed the beer and despite a formidable language barrier we got along well. 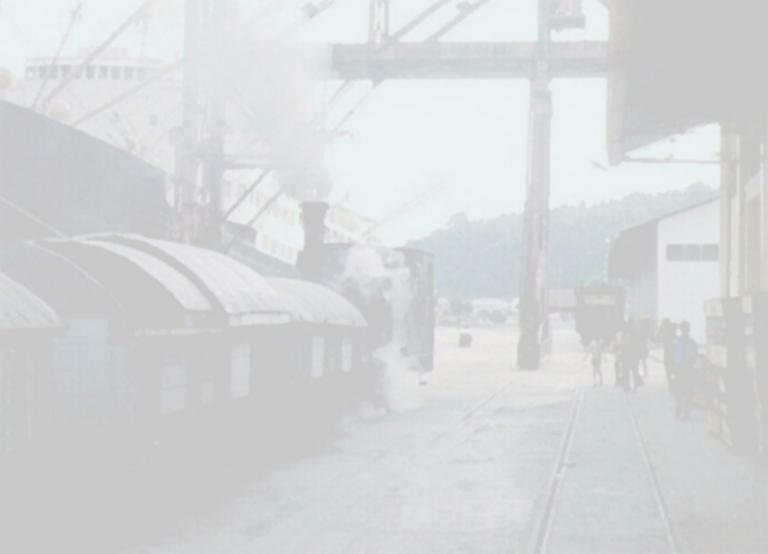 The footplate was ankle deep in coal and very dirty, and the loco was rather dilapidated. 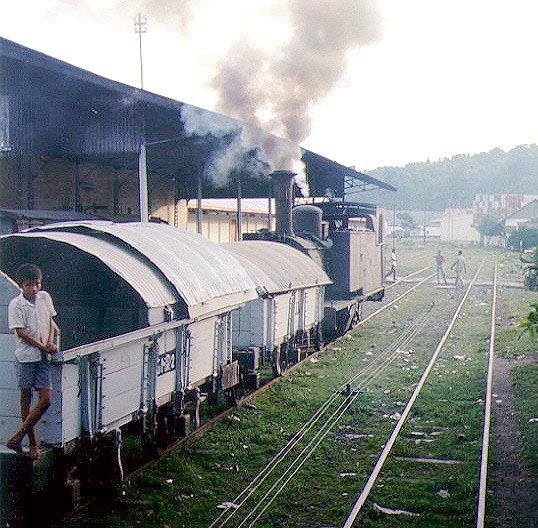 C33 shunting the quay sidings at Teluk Bayur. C3330 standing at the platform. 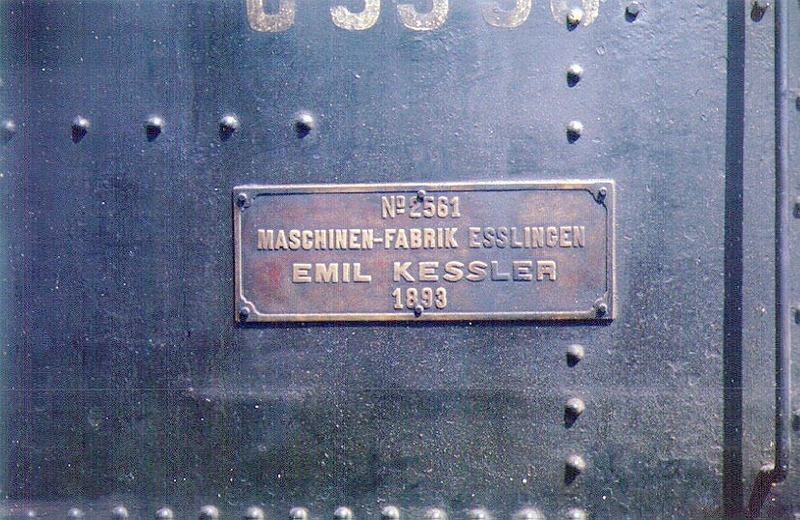 Passenger travel was on the roof or the platforms of goods stock. 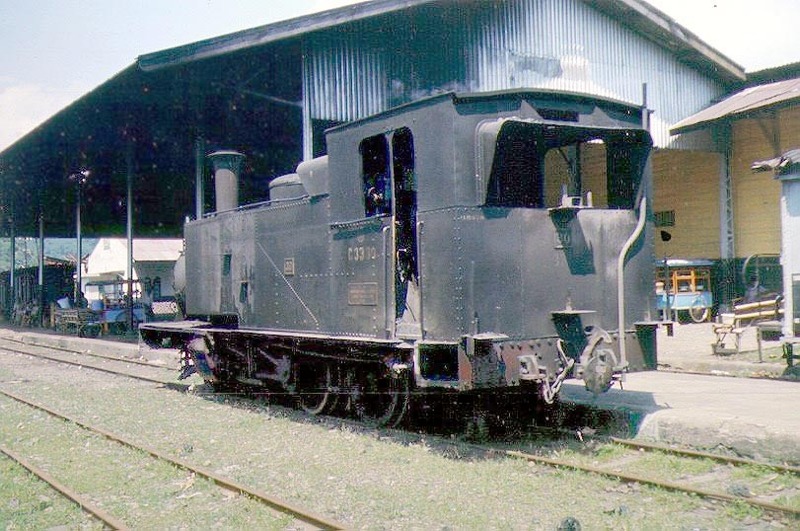 Rear view of sister loco C3321 with the fireman standing by. Behind the goods shed at Teluk Bayur. 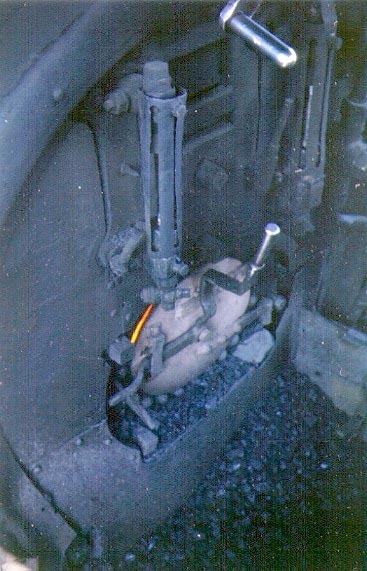 This shot of C3330 was taken from the footplate of C3321. 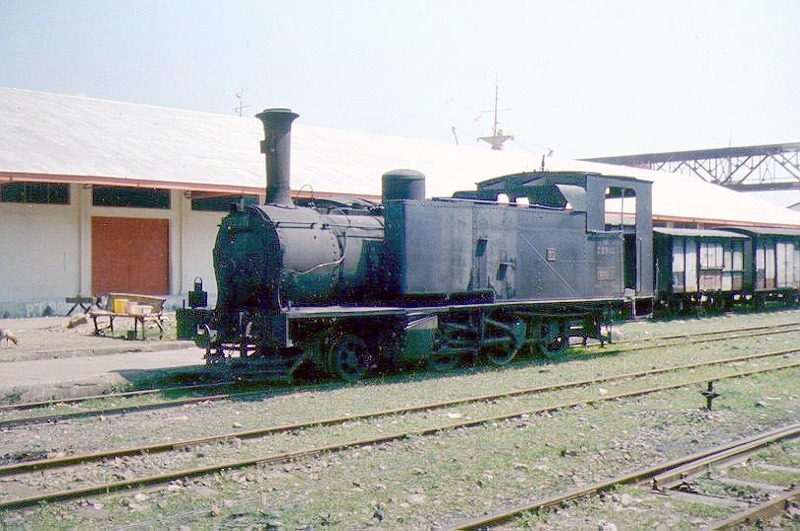 There were two locos assigned to the harbour job, one with reduced pressure due to the boiler's age, and the other in a somewhat better condition. 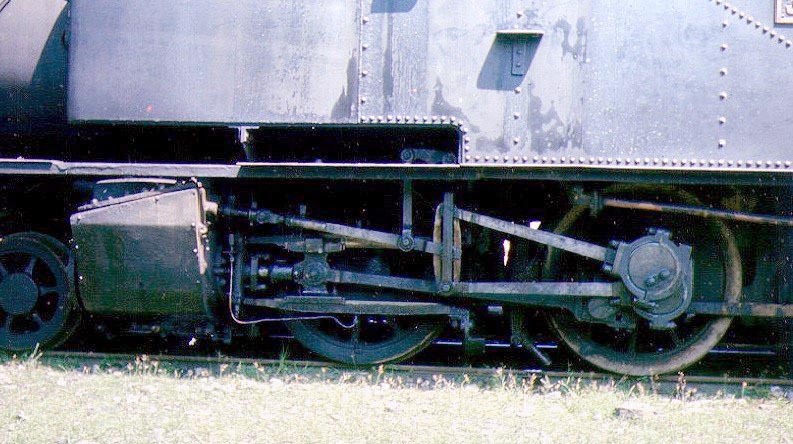 These Kessler-built locos, despite being quite ugly, had beautiful outside Allan scissors motion with two eccentrics mounted on a return crank on the driving crankpin. 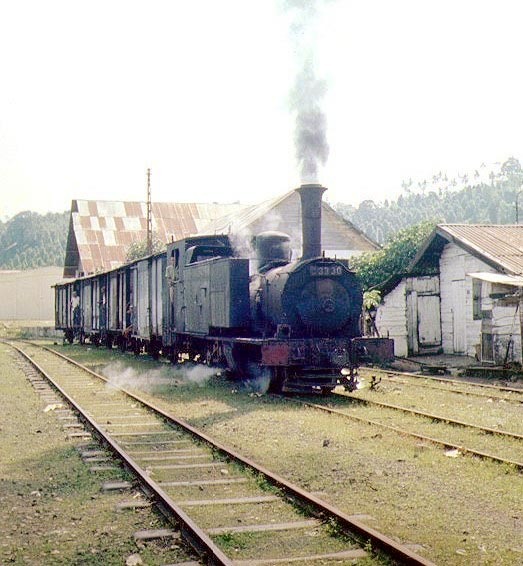 Similar locos once worked in Portugal. One free afternoon I walked a distance along the line towards a huge deserted coal storage complex which boasted tracks on two levels and a bridge towards a high-level loader over the harbour. 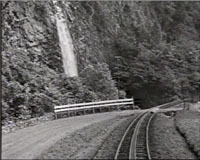 Here traces could be found of formerly busy traffic in coal mined in the interior, with a shunting neck right at the end of a low level bay, deserted hopper wagons and a long line of stationary coal bunkers on both sides of the overgrown area. I remember walking along the rusting track, keeping a watchful eye for snakes wherever I went. 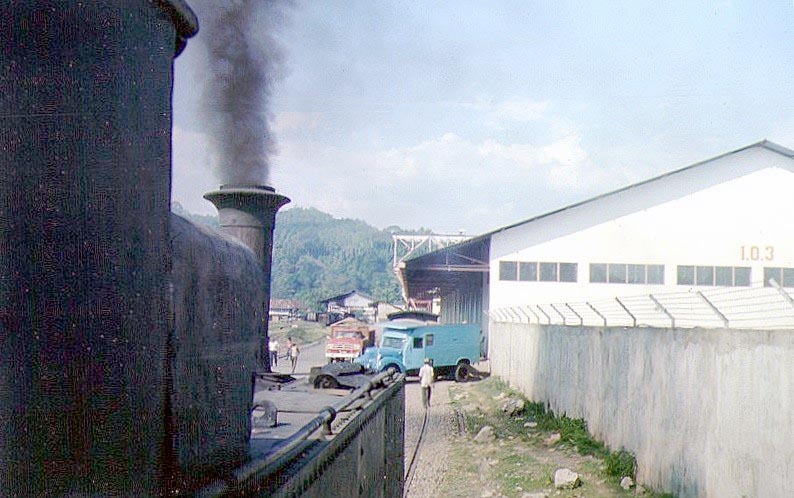 Looking towards Padang: in the distance the bridge from the coal hoppers towards the loading chute is seen. 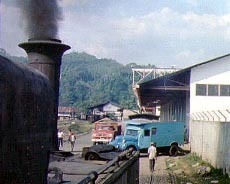 Line on the left leads towards the loading plant. I'm standing on the main line right now. 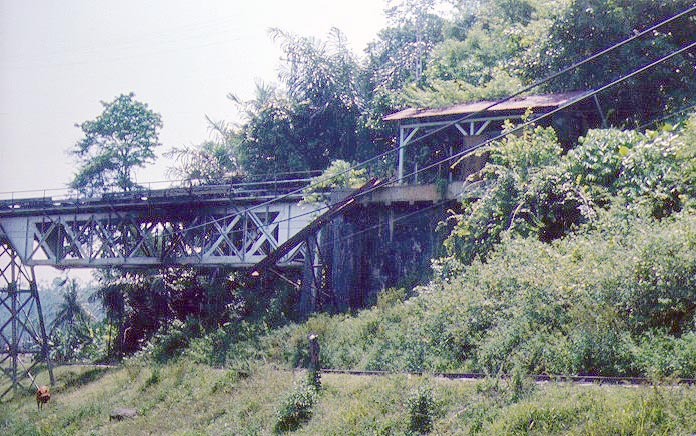 The bridge towards the coal loader. Again I am standing on the main line. The track in the foreground climbs from the harbour towards the storage complex which is to the right behind me. 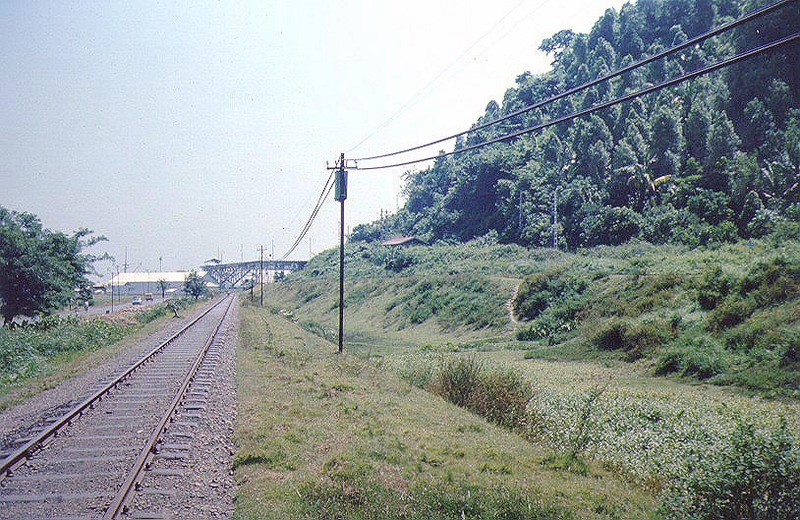 A look back along the main line reveals the bridge towards the coal loader in the distance. 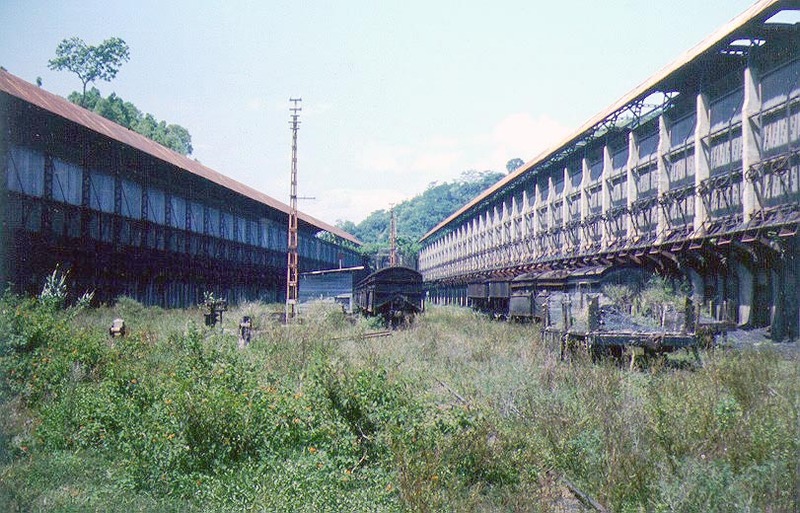 Coal loading plant at Teluk Bayur, with abandoned stock standing in the overgrown sidings. Other sidings run along the top of the bunkers. Derelict stock under the storage bins. 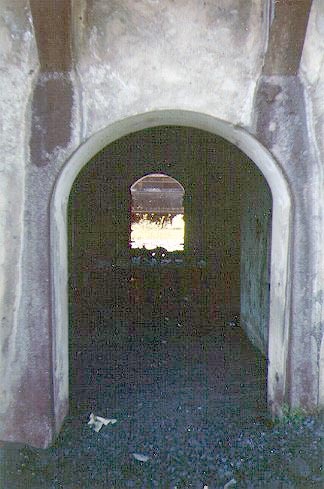 Rather dark photo showing the track underneath the storage structure. Only very recently I found out where all that coal must have come from. 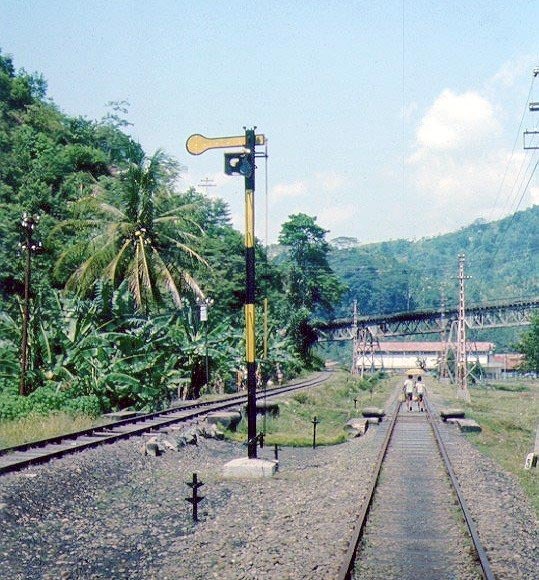 On inspecting a recently published atlas of old town maps in the former Dutch East Indies details can be found of the course of the railway through Padang and into the Anai gorge to Padangpanjang in the Padang Uplands. 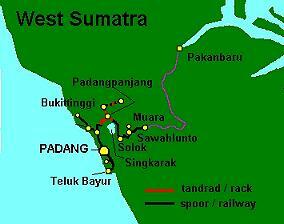 Here is a junction: the left hand line continues to Bukittinggi (a former hill resort similar in function to Darjeeling in India), the right-hand branch continues past the Singkarak lake (an old crater lake) to Solok, the mining town of Sawahlunto, a hundred miles into the interior, and Muara, the terminus. 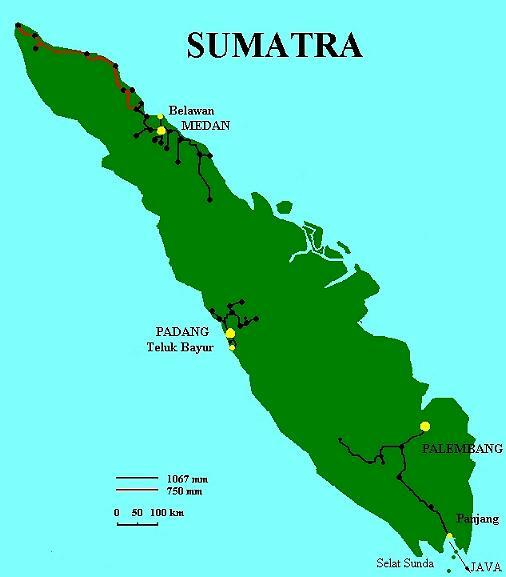 The map of Sawahlunto shows numerous collieries which according to the atlas produced about a third of the coal mined in the former Dutch East Indies in what was called the 'Umbilin Coal Field'. There was a big screening house and shunting yard, an aerial ropeway, a 'Decauville railway', the mining company's offices and even the mine officers' club. A prison was conveniently nearby across the railway, which makes one wonder at its relationship to the collieries! All of the coal must have passed through the installation I visited. I have since tried to figure out how the plant was supposed to operate. 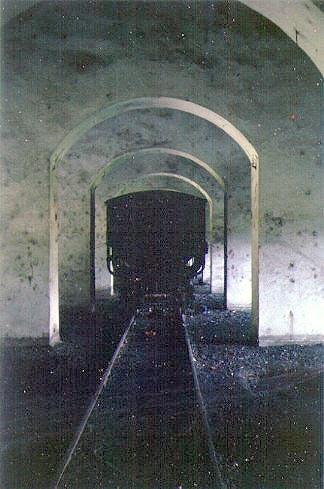 It seems that coal was stored there ready for loading into ships, being discharged into the bunkers from the upper level. When a ship came in, the coal was probably dropped into hopper wagons below which were then pushed on to the loader over the ship's hold. 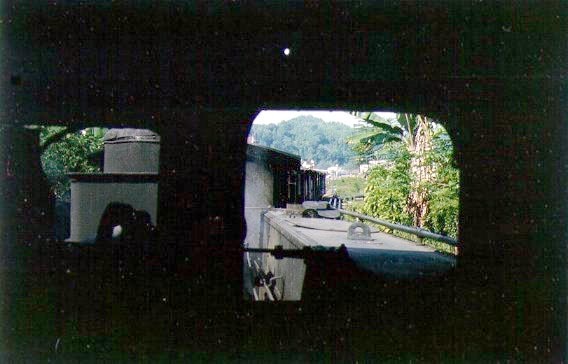 The strangest thing was the track right inside the bunker structure where a few derelict mine type hoppers could be found, without a mine in sight. I expect these were used to work the loader. Looking at the map I drew up, one period that should never be forgotten was when the Japanese military, during their wartime occupation of Sumatra, saw fit to build a primitive extension from the Padang system through the jungle to Pakan Baru on the northeast coast. 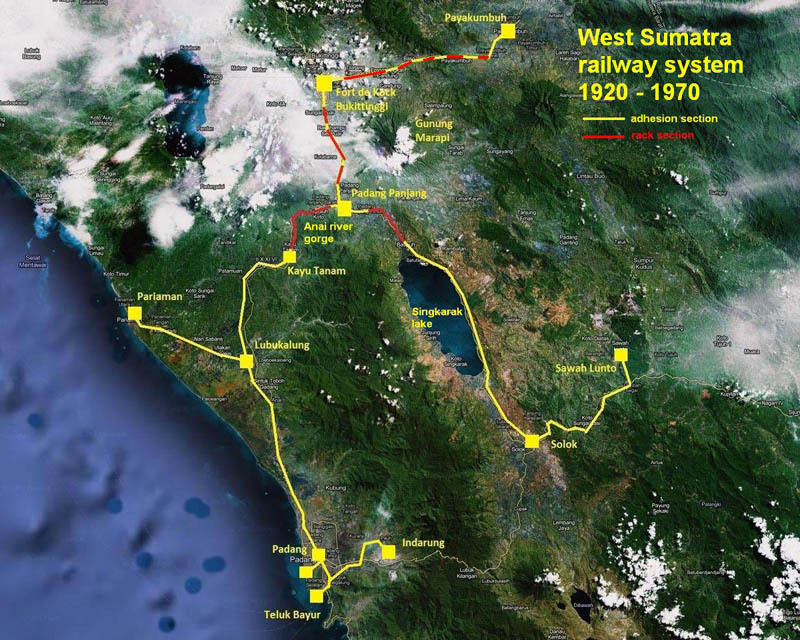 During 1944 and 1945, the Japanese used slave labour and Allied prisoners of war, including interned merchant seamen, to build this railway under the most inhumane conditions conceivable. Ironically at a great cost of lives, the Japanese declared the extension completed on the day the war ended and it never saw one train running.